This week, please welcome Mehandis! My name is Mehandis, I'm eight years old and I love Superman ice cream! I chose MY TEACHER IS AN ALIEN by Bruce Coville. I chose it because there's an alien on the cover. I liked the end when the alien got to go into space with one of the school kids. If my teacher was an alien, I'd leave school and take all the children and adults somewhere safe. Then when the aliens invade, we'd attack them. It has aliens and it's really interesting! The alien-teacher looks scary. The teacher is peeling off his face and it looks disgusting. It made me want to read it. It depends. If the next book also had a cool cover, I'd read it. ENCYCLOPEDIA BROWN by Donald J. Sobol. Except this book has aliens. Why didn't the aliens and the humans attack each other? "Sixty Grade is just... out of this world." Susan Simmons can tell that her new substitute teacher is really weird. 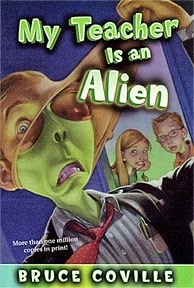 But she doesn't know how weird until she catches him peeling off his face -- and realizes Mr. Smith is really an alien! At first no one will believe her -- except Peter Thompson, the class brain. When Peter and Susan discover Mr. Smith's horrible plans for their classmates, they know they have to act fast. Only they can get rid of their extraterrestrial visitor -- and save the rest of the sixth grade class from a fate worse than math tests! Thanks for the interview! Now I must know what Superman ice cream is!